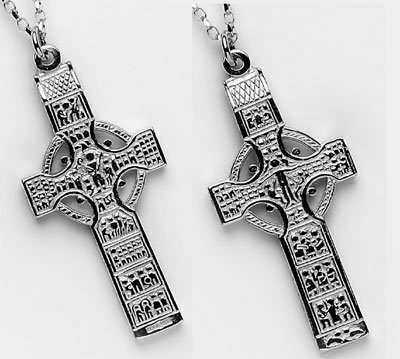 Beautiful sterling silver Celtic Cross Pendant faithfully captures all authentic detail of the original Saint Muirdeach’s cross at Monasterboice. Handmade and hallmarked in Ireland. 44mm high and 20mm wide. 6.9g silver weight. 7.9g gold weight. With 18 inch chain. be seen the inscription in Irish "OR DO MUIREDACH LASNDERNAD IN CHROS"
Domhaill, an abbot of Monasterboice who died about AD922. the keys to the one and The Book of the Gospel to the other.